Marshmallow is well-known for helping lubricate internal tissues, soothing skin ailments, and aiding the urinary tract. The entire plant can be harvested for healing treasures - use the root mainly for digestive and skin problems, and the leaf for soothing the lungs and the urinary system. Marshmallow, also classified as Althaea officinalis, is well-known for helping lubricate internal tissues, soothing skin ailments, and aiding the urinary tract. The entire plant can be harvested for healing treasures - use the root mainly for digestive and skin problems, and the leaf for soothing the lungs and the urinary system. Marshmallow is most notably used for its demulcent properties, but it can also act as an alterative, galactagogue, nutritive, diuretic, emollient, vulnerary, and expectorant. Its most distinguished nutrients are calcium, iodine, iron, pantothenic acid, sodium, and vitamins A and B-complex. For the urinary tract, marshmallow can be helpful with inflammations combined with gravel in the urine because of its soothing effects that protect the mucous membranes. These soothing actions will also ease respiratory and skin irritations like insect bites. When combined with cayenne in a topical poultice, marshmallow can help with gangrene, blood poisoning, burns, bruises, and wounds. 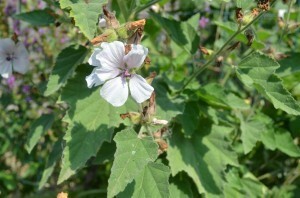 Externally, marshmallow root can also be used for varicose veins and boils.